Four winning AFL team selection strategies. What a great weekend we just had, Footy is back and I tell you what community, I’m bloody excited. If you’re anything like me you’ll already have a few headaches, maybe wondering where you can get the extra cash to get Goddard into your team or how many Port Adelaide rookies should you lock in or second guessing if Jordan Russell is in the Pies best 22 or not. It is for that reason I thought I’d change it up a little this week and instead of analysing any one player I’d look at something a little different and analysis the different strategies available to us as coaches. Strategy is a very important part of supercoach and can often be forgotten or ignored by the players of the game. Like in all aspects of life, from business right through to sport, setting out a strategy and planning around it is what leads to success. When I go out to play footy on the weekend we have a strategy, we have a game plan and we try to perform our roles and our tasks with-in that plan. More often than not when we get beat it’s not because we faced superior footballs but because the team we played had a better strategy, a better game plan and had flexibility to change as the conditions changed. I could give a hundred different examples from a hundred different life scenario’s but the moral of them all will be the same, the person/team/business/group etc that has the foresight to plan and strategize will be the most successful in their field. You don’t just blindly walk into success, you have to earn it. Supercoach success is no different. A lot of coaches out there at the moment are chopping and changing their teams week by week, or in some cases even day by day, but what they end up having is a miss mash of a team and no real direction. Are you one of those coaches who spend hours and hours on your team only to find yourself back at to where you started in the first place?? From the wry smile across your face I take it you are one such coach but fret not I can assure you there is more than just yourself, it’s a very common problem and a lot of it stems from a lack of a plan, from a lack of a strategy. In a moment I will be giving you some examples of some of the many strategies available to you, but even if there isn’t any on the below list that tickles your fancy, I urge you to come up with your own or adapt one of the below to suit yourself and stick with it. You’ll find that instead of looking at a whole spectrum of players and trying to mash the best ones into your team, you will be looking for the best players that suit your strategy and it will work out easier to swap those players in and out of your team. For example, if you have a set strategy that see’s you have three super elite players in the midfield and you just seen Swan tear it up over the weekend, you would simply just take one of your super elites out (the one who doesn’t appear to be in great form) and replace him with the in-form Swan. If you don’t have a strategy you will more than likely try every possible scenario to get Swan in and jeopardise the rest of your team in doing so. The above example shows a typical Guns and Rookie Team. It is exactly what it says it is; a team made up entirely of Premiums (Guns) and rookies. When building your team, simply pick one gun then one rookie through all the lines until you run out of money to pick any more premiums, and then fill the remaining spots with rookies. In past seasons the guns and rookie approach was very popular and to a large degree very successful. With just a little bit of research it’s not that difficult to source out the good rookies that will play and score well. You can find all that information right here. You won’t have to fret over any mid-price players that may or may not “break out”. With 30 trades this year you can afford to start upgrading those rookies before they have reached their peak value and come finals you really should have a team of 22 premiums. This year there appears to be a lack of quality rookies in the back, forwards and ruck lines which could lead to either really poor scores or even in a worst case scenario doughnuts and wasted trades. The sub rule. In years past we didn’t have to worry about the sub rule but now the problem with starting with so many rookies is you are increasing the likelihood that you will have sub affected scores. Rookies are key candidates for the sub-vest as they are likely eased in at AFL level. Even with the rolling lock out there is nothing you can do if they come off in the third quarter. In the early part of the year you may not score as well as other teams until your upgrading kicks into gear from round 6/7. By then you might be too far off the pace, or if you’re looking for the league success, you might have copped some early loses against teams with other strategies. For me personally, I don’t think the pure Gun and Rookie approach is the way to go this season. I feel the disadvantages outweigh the advantages and I am particularly worried about the quality of rookies in the forward line. As you can see from the above example, a Mid-price Team isn’t just a team of Mid-price players. It still has top level premiums and the bargain basement rookies, but just not as many as the Gun and Rookie option, and is more based around a core of Mid-price Players. Generally a mid-price player is valued between $215k and $499k, and when picking one of these players you are looking for value or a breakout contender. When constructing your team I find it easier to pick your premiums and rookies first, and then fill up the rest with the players you feel offer value or are ready to break out. With 30 trades this year it can be argued that a little more risk can be taken with your initial team, as it won’t be catastrophic if you have to use a few corrective trades early if you have picked up a dud mid-price player. Pick the right mid-pricer from the start and you already have one up on the rest of the comp who struggle to trade in that breakout star. Think Beams and Dangerfield in 2012. This year there appears to be a wealth of value mid-price players that are on the comeback trail from injury and have showed in past seasons a capability to score well. The likelihood is that your Mid-price Team should outscore the Guns and Rookie Strategy in the early stages, as you have reduced exposure to poor scoring rookies and sub affected scores. This could get you valuable wins in your league and keep you in the hunt for the 50k. For every Beams and Dangerfield who break out and become elite or super elite premiums, there are two or three players that stagnate or even regress. Think Broughton or Lake in 2012. Finding that diamond in the rough isn’t as easy as you think and comes with great risk. Players returning from injury bring their own risks. It can take time to find form again, they have the potential to be eased back in and could cop the sub-vest as a result, and then there is always the possibility of aggregating an old injury or picking up a new soft tissue injury. It can be very hard to justify trading out a player that is still scoring well but just not at elite or super elite level. I discussed this in the Premium Trap and come finals you will want a team full of the elites and super elites. If you don’t, someone else will, and they will be the ones taking out the flag. For me personally I think this strategy offers more reward than a pure Gun and Rookie approach. I have a simple rule with players coming back from injury. They must have completed a full preseason with no setbacks or incidents or they don’t get a jumper. When looking for a breakout contender, look for players that have a new role, namely as a rebounding defender, on the wing or in the guts. Think Dangerfield 2012. Others to watch are the ones that have strong natural progression. Trent Cotchin in 2012 springs to mind. The above team shows an example of this little left field Strategy. It is as simple as loading up the midfield with elite and super elite players, locking them in and throwing away the key and forgetting about them for the rest of the year. You then fill the rest of your initial team as best you can with the limited money you have left and concentrate on upgrading these other lines as the season progresses. As discussed in the Premium Trap, it is the midfielders who make up the majority of the elite and super elite players (in 2012 there were only 6 non-midfield players with elite status), so it would make sense to pick as many as possible in your starting line-up. Midfield players generally hold their value a lot better than both forwards and defenders and thus are harder to upgrade to during the year. On the flip side with defenders and forwards fluctuating a lot more it tends to be easier to find a bargain or two in those lines during the year. Having a “Unique Team”. As this is a little different the chances are your team will be a lot different than all the others you are likely to face in your league. I for one love being a little out there and having a team that reflects my personality … I’m MAD I tell ya .. MAD !!! As the preseason has developed it has come to light that there are a number of potentially high scoring rookies available in the midfield. Go with this strategy and you’ll most likely be forfeiting the highest scoring rookies in the competition, which is something I don’t like to do. As discussed earlier, this year there appears to be a lack of quality rookies in the back, forwards and ruck lines, and with spending so much money in the midfield you will have to rely on rookies across these other lines. I have to admit community, once the new rules were announced this year I got very excited. Immediately I thought about having 8 elite or super elite midfielders in my team, but as this preseason has gone on and the talented midfield rookies emerged combined with a lack of talent in the other lines, I have gone away from this approach. This is another left field Strategy which is much the opposite of the Locked and Loaded Midfield. Instead of loading up the midfield with elite and super elite players, you load up your midfield with rookies instead, and fill all your other lines with the elites. The advantages and disadvantages are basically reversed for this one but have a read anyway. The best rookies are clearly available in the midfield this year so it makes sense to pick a rookie who could average 80 in the midfield compared to picking a rookie in the backline that might only average 60. You get the better points and you get the better value from that player. Watch on as they bring in the coin. Use this strategy and you won’t have to concern yourself with playing any rookies in the back or forward lines, and instead pick up solid and generally safer options in those lines. Forwards and defenders tend to lose more value than midfielders, so you could potentially be losing any value gained by picking up the best rookies by selecting overpriced premiums in your initial team’s forward and back lines. These players that can be picked up by other teams later in the year at discounted prices. The best premium midfielders are hard to upgrade to as the likelihood is you will have to pay out over 600k for the best ones. There is quite a gulf between an 80 average from a rookie and a 120 average from a super elite player, and if this margin can’t be made up by your forward and defender premiums, then you may struggle early until you are able to upgrade those rookies. I have surprised myself community and have gone full circle this preseason. I have to admit I am swayed heavily towards this strategy. I feel I can be a little suave with my selections in the forward and back line, and get the best value premiums in those lines. If I can do that, I am confident in the ability of the rookies in the middle to keep my scores high early, and then I’d expect to bring it home with a bang as my upgrades come into play in the middle of the season. Final Word: And you thought you had a headache picking players .. now pick a strategy as well. Click here for more from Mick. Mad as a cut snake.. but one of the finest AFL Fantasy strategists in the nation. Great article and maybe too good. Rookies can grab one of those teams and start out pretty good. Sensing Jock may have knocked off early today and spent the afternoon "romancing the can". …. As is his usual custom. I believe the rookie midfied option is a huge risk considering that some of those fine young player might not play every game making your midfield a dudd. Furthermore, as stated in this article, the midfield is where all the elites are located so why not use the mid price or the lock and loaded midfield which ensures less risk. any opinions on this cattle i'm planning to go into the season with. Thanks, will keep an eye on them. If Nicnat's fit expecting him to have a huge season. I think there should be a 5th type of team that has a heavy emphasis on swing sets. Excellent point Brick, however, a keen focus on swing sets will take your eyes off the important skill in picking the best players. The introduction of the new trade rule that allows for any dual positions to be traded across lines, without a swing, reduces the need for a functional swing set. Having said all of this, I do consider the Ruck/Forward swing to be important this year. …. particularly in Supercoach. Confucius say, "Team built around swing set, beware of the slide." What are you doing to me Mick? I thought I had my strategy down pat (similar to Shannon's) but rookie mid madness is a tasty proposition with all the kids coming through there this year. Nice article! Great to hear from you Kermit. I still have a teddybear of you I got as a child. Its a great honour to be relying to a comment of yours, Huge Fan !!! Hey mick ya mad [email protected] why the love for J Witts in da ruck. Tought he was a spud. You got mail bro? P.s best article Eva red mick. I owe you a Guinness. DaBoozaMan, you know I can't resist a good Guinness. Great stuff, Mick. It'll be interesting to see what type of strategy everyone goes with! My team is kind of a "Mid-price Team" and "Guns and Rookies" hybrid. 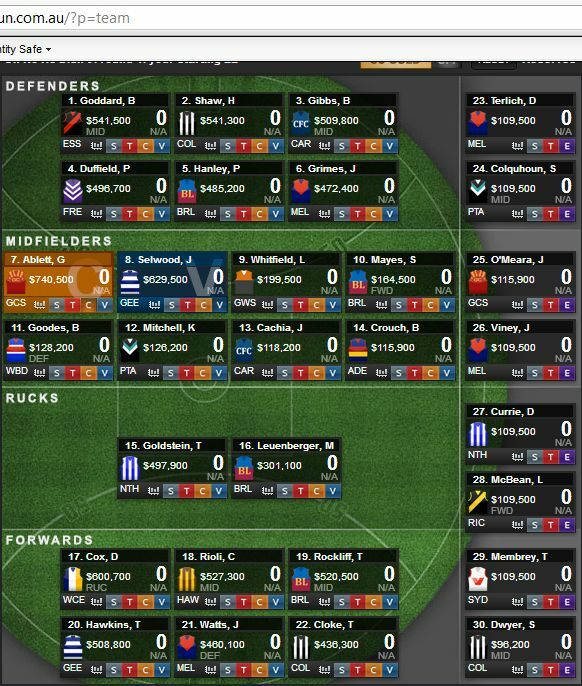 I've gone for more of a mid-priced backline, but i've beefed up the mids more than a normal "Mid-price Team". I've got 3 Ultra Premiums instead of the 2 and grabbed Shuey and Fyfe instead of mid-price mids like Moloney, Embley and Ball. Picked big Ivan and Leuy in my rucks so i've got at least 1 keeper there, as well as Cox in my FWDS should Luey be an injury bust again. My thinking is i'll reduce some of the risk of picking the $300,000-$400,000 mids who have have the highest chance of producing average scores and beef them up to at or near premium mids who have a higher chance of producing good scores at the cost of reducing one of my ultra premiums and my backline initially. Great stuff as always MRB37, I think a hybrid of them two is a very good idea .. use the best strategy available in the different lines. I can tell you my current team isn't just one of those strategies and is more of a hybrid too. You should go really good this year, you chasing the 50k ?? Always chasing the money, mate but as long as I’m winning league games then I’m happy. Gotta step up my game a bit this year though! After that mark there should be a "teams with Majak Daw" scenario. Holy Snappin JOCKetts Mick.. you are just flamin' MAAAD! This article gets the blood pumping and the heart thumpin'. The guns and rookies is fraught with danger. The mid pricers have plenty of value and you showed that well. Rookie mid stacked is so tempting piling up all that cash and the super mids was one of my tasty treat thoughts in the preseason like you. But Higgo and I are like twins separated in the wooomb and delivered by different mothers ( looking almost totally identical=yes we occasionally both have beards at the same time). Ruck Forward emphasis including heavy swing options matched with the balanced midfield supers and rookies to help score big and $$$$ development is the key for old Biggie this 2013 season and hoping that comes off. Super coach Platinum! Onya Mick! One of the best articles EVER!!! So thank you for such great work…Personally I am going for a GNR Mid Price Hybrid!!!! I think a totally GNR approach this year would mean being off the pace early…I have winning my League in mind this year, hence my approach!!! I'm running with the GnR in the mids with the twist being 14 of the 16 def/fwds have duel midfield status. Great article. Seriously considering the rookie midfield one. Fwd: Franklin, Walker, Lecras, Varcoe, Daniher, Menzel, Lee, Kerridge. That still leaves roughly 400k in the bank. So could go one more premium or just bank it. Dave never leave money in the bank, its no good there. Always think in points, with 400k you could easily upgrade a rookie who scores 60pts to an elite who scores 110pts. That is 50pts a game or 1150pts in a season. Not sure I 100% agree with you there Mick. A bit of cash can be bloody handy to have around for that first trade up. I do however concur that leaving an amount like 400k in the bank is going a bit over the top!I'm looking to have around 100k left spare, and I know some will probably want even more of a buffer than that. He's having a very good preseason by all accounts but I don't think he's in the best 22 for the Blues. I just put in him one of those teams to share the love and not use all the same players .. Fantastic article Mick. I have flagged this to review again last minute after the NAB cup and challenge matches are done and the scores are available. Another great article Mick. I have to say at this stage the most appealing to me is a mid price team, although the rookie midfield madness idea has crossed my mind too and could be a ripper. Hey Mick from one mad Kelt to another …Thanks for making me re-Jig (Skeedelee diddlee Doooe) my entire startagy slash half plan with a pinch of bloody drunken insperation, How many nights with out intrnet becauce of random 'puter klich… Worked on paper from print out… Got team that I finally was happ y with ya this far out I had it nailed The 50K was mine…but ….Now I have to dance to a new tune as from the comment s above my team is No Longer Unique. No Goddard..Happy me..No Ball.. happy me .. No Cooking with Embr's happy me No Cotchin happy me..
What I do have is Hanley Locked In GAJ, Pendles Swan Cox roughy Maric if he is up Shuey and Mundy for now and the only difinate mid Fwd swing Varcoe and a smokey Suban… But of course that's just to-days team Tommorow when I'm sober and Jock stops tellin me to put in Siposs I will re visit and tweek only to get drunl again and say to my self "Self!.. What are you thinking pull out Embers and put in Conca.." I really think I need a Slipper at least it talks! Breust by a consistant mile. No injury troubles, no selection worries, no heart problems! Well thought out write up! I've been torn between 2 options for the midfield but I've still got some queries and doubts. I've been tossing up between 4-1-3 and 5-0-3 but I stil wonder with 3 or more rookies will it be pure luck that there are dirt cheap, playing rookies to downgrade to? I don't like the idea of being stuck with non scoring, non cash making rookies on the bench after initial upgrades and downgrades. Am I way off track with this thought? Oh, Supercoach and the love/hate mind boggling relationship we share…. what are you looking at Ruck wise? great read…. now what the hell do i do with my team?! time to have a rethink! me honestly that you have never considered the benefits. they could, while a majority wished that they could work a shorter week. combat diabetes; you can use Google Ad – Words tool to find keywords associated with the niche. body fat. Simeons manuscript should be gone over before starting the HCG drops diet. Cancer is a problem made infinitely worse by the medical establishment. authorized foods to replace what may be lost from these two groups, but for someone who is not ready to give up milk and grain products, it is not a practical choice. Schwartz also said that this diet has a good track record with people not gaining the weight back once they’ve reached their goal and have stopped taking the hormones.